This post is part of our online forum on Race, Property, and Economic History. The double entendre “dark city” has often conveyed and conceptualized both the blighted landscape and the racial populations of cities, and more specifically inner cities. Although historically represented as impoverished, racialized, high crime urbanities, inner cities are transitioning into green city centers with a vastly different demographic. White and wealthy people populate these urban oases, who now occupy a landscape with far greener pastures. 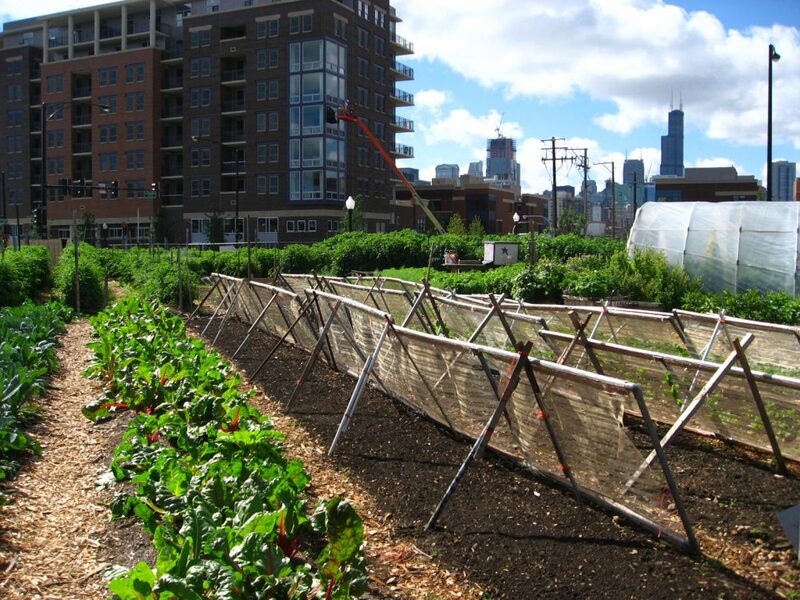 Globally, cities have been implementing environmental policies and practices that have led to the proliferation of green spaces (parks, gardens, and urban agriculture), which gave rise to the concept of the “green city,” an urban area designed to advance sustainability goals, address climate change, improve quality of life, and minimize negative environmental impacts. The dark city and the green city can be understood as two competing realities simultaneously unfolding within the urban landscape as cities negotiate with their pasts and their futures in the present. The “dark green city” marks the fault line where these two tectonic realities, the dark city and the green city, are shifting and creating catastrophic friction and massive societal change while recreating both the urban landscape and its inhabitants. Within the dark green city, one’s economic and racial status determines whether the urban experience is utopian or dystopian. To understand these two divergent and warring urban concepts of race and space we must both deconstruct them and anchor them within their histories. Within the US context, the lineage of the dark city goes back to the turn of the 19th century at the rise of the industrial era. The urban landscape was a perilous place to live in the late 1800s; floods of European immigrants overwhelmed the inadequate urban infrastructure. Overcrowded housing was the standard, and health conditions were critical. Neighborhood streets flowed with open sewage and those fortunate enough to have windows would have to cope with panes blackened by soot from coal burning stoves. Industrial factories spewed noxious smoke and gasses onto the surrounding communities, causing severe health crises. Cholera and typhoid decimated neighborhoods due to the unsanitary conditions. The hordes of questionable, non-Anglo-Saxon, immigrants with their starkly strange cultural differences coupled with dire urban conditions implicated them as both the cause and the product of the dark and dirty city. It was during this same period that the ideological underpinnings of modern environmental thought emerged. Affectionately known as the father of National Parks and the founder of the Sierra Club, John Muir was pivotal in constructing the concept of nature. He was an environmental philosopher, scholar of the natural sciences, and praised as a botanist. Muir’s legacy and his perception of “the wilderness” ultimately created the chasm between the natural environment, the wilderness, and the built environment, the city. For Muir, the wilderness was the epitome of what nature was in its most pristine form, untouched by man. This construction of nature also created the ideological schism between nature and man resulting in the understanding that human beings are outside of and separate from nature, and even more crucially, that nature must be protected from man who will destroy nature for its resources and to create more cities. Thus configured, nature was a place to travel to and a landscape to escape from the dirty urban landscape, the human habitat. Cities were hopelessly unable to ever hold or grow nature in any authentic or meaningful way. 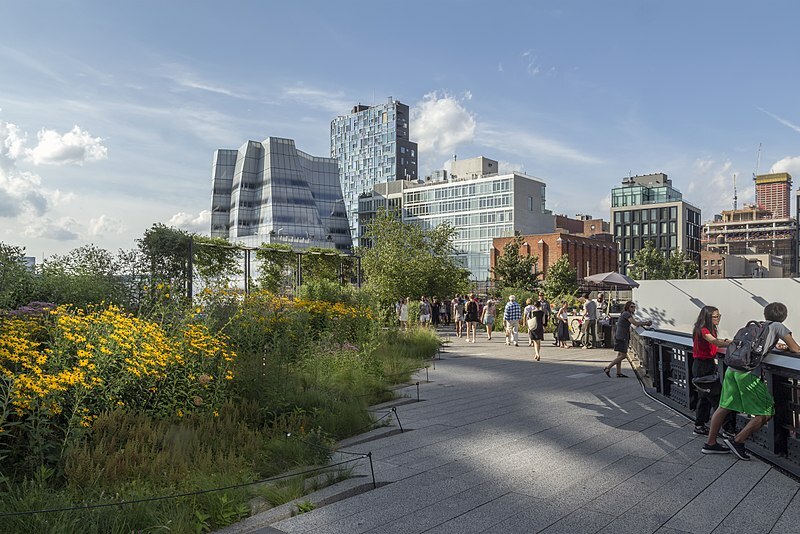 New York High Line is a new trend in urban green space design and park proliferation (Credit: Wikimedia Commons). What often gets overlooked, if not outright ignored, in the narratives around the creation of the National Parks, and Yosemite in particular, is the violent removal of Native Americans from their ancestral lands. This was influenced by John Muir himself, accomplished through the intervention of the federal government, carried out through the use of military force, and implemented with genocidal intentions; these “protected lands” did not protect the non-white populations who called it home. It became and continues to be the refuge and retreat for the city’s elite and carved its way into a white middle-class cultural practice of camping and hiking from the 1950s to the present. New York’s Central Park, created only years before Yosemite National Park, has a similar story. Frederick Law Olmstead and his company were epic in urban park creation. A British garden aesthetic intended to mimic a natural landscape defined Central Park’s design. This built nature was only simulacra, a simulation, to the sublime wildness of Muir. While Olmsted had an anthropocentric or human centered view when considering nature, he believed that the working class and not just the elite should have access to nature. Unfortunately, this did not stop the displacement of the residents that lived there. The construction of Central Park dismantled and destroyed Seneca Village, a thriving predominantly African American community of homeowners that were displaced using eminent domain. Today, lining the perimeter of Central Park reside some of the most expensive private homes on the globe. The suburbanization of process the 1940-1960s that welcomed whites into middle-class status and homeownership also funneled African American populations into atrophying urban centers and recreating a new concept of the dark city, the ghetto. Kenneth Clark’s seminal work, Dark Ghetto: Dilemmas of Social Power, contextualizes the racialized urban space as ugly, dirty, and of filth with crowded streets and seedy parks that show lack of care, with “the only constant characteristic is a sense of inadequacy.” By contrast, the emergence of the Green City holds to both an environmental ideology and ethic standing in direct contrast to, and in contempt of, the dark city and its residents. The green city is revealing its sordid environmental roots and reproducing the ongoing violent removal of local undesirable populations to protect “the environment,” only this time embedded in the rhetoric of sustainability, climate change, and global warming. This disturbing and emerging trend of gentrification that touts an environmental ethic has come to bear on the most vulnerable residents, people of color and low-income residents, forcing them to the bottom of their city’s concerns. The green city is perpetuating environmental injustices in which vulnerable communities are not only subjected to environmental disamenities but also prevented from benefiting from environmental amenities. Now people of color contend with the other side of environmental racism, green gentrification, the displacement from areas with green space creation, restoration, and beautification projects. 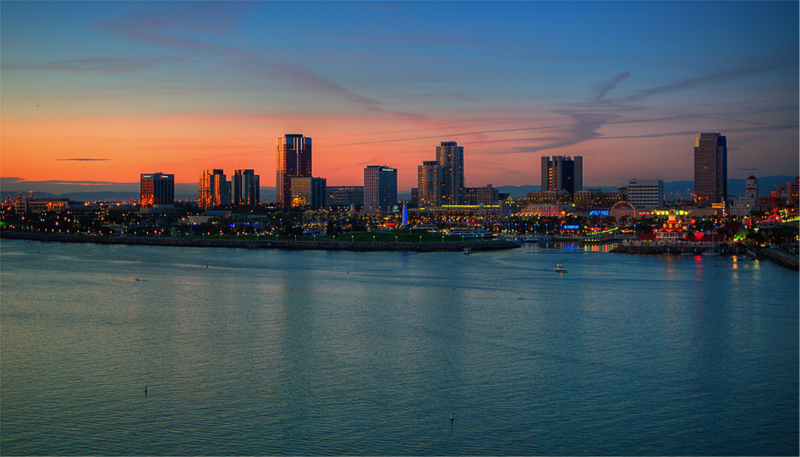 Downtown Long Beach, California, where gentrification is most acute in the city (Credit: Wikimedia Commons). Through city planning and the implementation of urban environmental policy and practices, green gentrification has become not only the tool but the outcome of a new urban renewal strategy. This green urban renewal process displaces the very populations who need healthy urban environments the most. It is also creating an environmental justice crisis in which those that are displaced are not merely being forced out of their neighborhoods but in places like Oakland and the San Francisco they are being displaced from their city and in many cases from their state altogether. They are most likely only to move to another environmentally unjust area. Although green gentrification does not always come at the expense of displacement, it always transpires as a form of exclusion. For example, new signature parks like Railroad Park in Birmingham, AL are lined with condos and market rate housing allowing only the wealthy the opportunity live next to this newly created and charismatic urban nature. As dark cities transition to green cities municipal master plans, policies, and practices work together to displace and erase low-income neighborhoods and communities of color. Ultimately, cities are envisioning a greener future without them. But we stand in the liminal space of an in-between in which neither the dark city nor the green city has fully taken place. Truth is, dark cities were never fully dark. Despite the lackluster landscape, dark cities, have always had bursts of light that emanated from the diverse communities that found ways to celebrate their life and culture in beautiful ways, in the streets, and amongst neighbors. Likewise, green cities will never be perfect urban landscapes if made to sanitize and exclude the diversity of humanity for economic and environmental ends. C.N.E. Corbin is a PhD Candidate at the University of California, Berkeley in the Department of Environmental Science, Policy and Management within the Division of Society & Environment. Corbin’s research examines the relationships between society and nature within the built environment by investigating the concept of the green city within the United States. Follow her on Twitter @CNECorbin.